The president announced via Twitter that the U.S. and Mexico had reached a preliminary deal to scrap the North American Free Trade Agreement, better known as NAFTA. 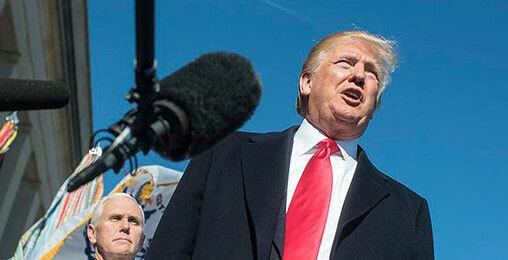 Trump said the new bilateral deal would be renamed the U.S–Mexico Trade Agreement. NAFTA, as you likely already know, is a trilateral trade agreement, which includes Canada. And it looks like Canada may be next to work out something with President Trump. With major market indicators going haywire, you need more than your wits to know the best time to strike. This incredible tool, one part of this incredible strategy, isn’t susceptible to noise… and can pinpoint the exact moment to make a move. Fearing being left behind, Canadian Foreign Affairs Minister Chrystia Freeland cut short a European trip to fly to Washington for talks on Tuesday. Now, plenty must happen before a new trade deal comes together. Congress (as well as its counterparts in Mexico) must ratify any new deal… and senior U.S. lawmakers prefer a reworked trade agreement that includes Canada. Nevertheless, this news bolsters our Trump Trade War Theory. On July 10, I wrote that President Trump is setting the stage for major trade deals going into November’s midterm elections. As I laid out then, Trump’s plan is to help Republicans retain the majority in Congress. Cancel any meeting you’ve got lined up for Monday morning, and do it now. At least NOT if you won’t be done by exactly 9 am. Because that’s when we’re opening the next window on Wall Street’s bizarre instant income secret… where you stand to learn how to collect a minimum of $750 in instant cash. You’ll see why when you click this link for details – the clock is ticking. Now, we don’t like talking politics at the Daily. Our job is to show you ways to make money—but trade talks in Washington will affect every economy and stock market across the globe. As I said back in July, I have no proof that this is Trump’s master plan. 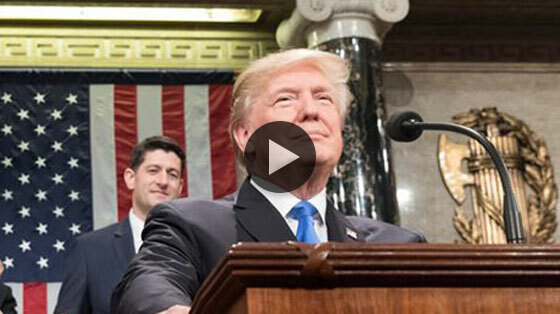 But while others thought the president was just talking tough… I saw the outlines of a broad strategy—to create a surging economy that helps his fellow Republicans keep Congress. The president will keep up his tough trade rhetoric for a while. That will keep a lid on the market this summer. As the midterm elections approach, he’ll start toning down his rhetoric and signing new trade deals with China, Canada, Mexico, and the European Union. Once he does that, the market will rejoice… It’ll be off to the races. I’m looking for him to strike some deals starting in late August or early September. Those deals should set off a market rally for the ages. Here we are… at the end of August… and the strategy appears to be playing out. Trump announced on Monday that a deal with Mexico is in the works. And U.S. markets surged on the news. Now, I have no idea whether the trade deal with Mexico will be a good one… or whether a healthy economy and strong market will help Republicans keep Congress. But I do know the market loves the fact that a deal has been announced because it indicates the trade war will simmer down. In the week leading up to the announcement, the S&P 500 rose 1.9%. That’s a huge move… and a good start to the 10–15% rally that I predicted we’d see going into the elections. The press didn’t understand it. Even members of his own cabinet were perplexed. 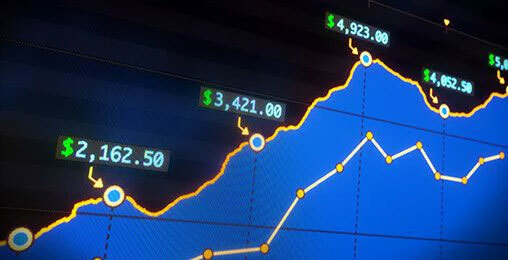 But for smart investors who act now, it could be the key to massive stock market profits. In July, other media outlets finally started to catch on to the best way to play the trade war. They told you to buy the small-cap iShares Russell 2000 ETF (IWM) because those companies are more insulated from a trade war than multinationals. They were over a year late to the game. We told you to hide out in IWM in June 2017. I also said the two sectors that would benefit most from declining trade war tensions are industrials and consumer staples. How’s that playing out? As you can see in the chart above, both sectors are outperforming the iShares Russell 2000. Consumer staples stocks pulled back last week because they’re often used as a safety trade. Investors saw the U.S.–Mexico trade announcement coming… so there was less to be fearful of. They sold the sector in lieu of more speculative opportunities. But that will be temporary. You’ll see these companies increase earnings during the next quarter. And their rise will continue. As trade tensions die down, we’ll continue to see the market rally. 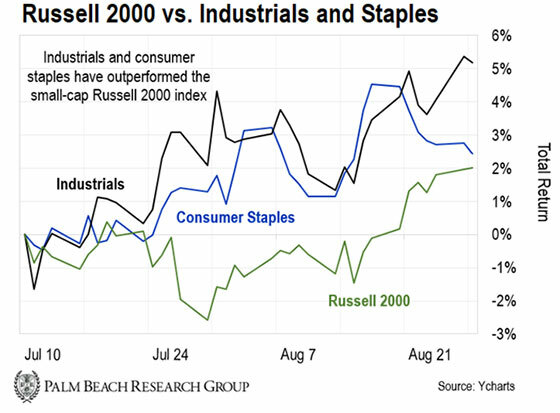 You’ll want to have more exposure to industrials and consumer staples to take advantage of it. From Tom E.: I want to thank everyone at the Daily for this fantastic gift. I appreciate it very much, will follow all the recommendations, and look forward to the opportunity to gain some wealth over time. From Clint H.: Hi, Nick. In Tuesday’s Daily, you wrote about companies that offer special dividends. Someone told me once that if the stock price drops, so does the value of the dividend—and in the few I looked at, that was the case. What would be the value of the dividend to someone who already owned the stock? Does that happen for regular dividends around the ex-dividend date? Nick’s Reply: You’re right, Clint. 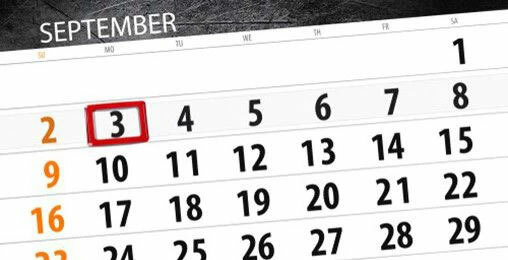 First, let me explain the ex-dividend date for readers who may not be familiar with it. When a company declares a dividend, it sets a record date when you must be on the company’s books as a shareholder to receive the dividend. If a trader purchases a stock on its ex-dividend date or later, he or she will not receive the next dividend payment. When any business pays a dividend, its stock price decreases by the amount of the dividend on the ex-dividend date. This happens for both special and regular dividends. The benefit of these payments, especially large special dividends, is that the stock price quickly recovers. Take TransDigm as an example. Its last three dividends yielded more than 10%. It took an average of 14 weeks for the stock price to return to where it was before the dividend. If you annualized that, it’s about a 35% return. That’s three times more than the long-term return of the S&P 500. That’s because they don’t want President Trump to get credit for some Americans receiving anywhere from a few hundred dollars to as much as $8,979 per check. This is due to the 2008 bank bailout scandal, which Capitol Hill just remedied with law S.2155. It’s caused a domino effect in the markets—one that could mean thousands for investors. How long this will last isn’t clear.